So, 2018 was one of the toughest years of my life. It was a story of two halves. The first half was a celebration of going full time in the industry that had been calling me for years, and plugging away, checking off tasks, and moving forward. Then, April 28th came. My oldest daughter, Emily, who had seen her sister battle Type 1 Diabetes for 6 years, lay in a hospital bed, with a near-fatal blood sugar fighting to stay awake enough to inject herself with a needle. That week was rough, to say the least. Many tears, lots of heartaches, and even more worry added to the revelation that we had two T1D girls who did nothing to deserve such a diagnosis. The year went on, and frankly, I struggled to stay focused many days. I love what I do. I love being a part of weddings and celebrations, but the day to day, get tasks done was a challenge. As a family, we all lost some of our energy and faith in thinking “everything was in God’s plan,” but I pushed forward and gave everything I had left in me from May on and as that New Year countdown came in a crazy fun wedding down in Charles City, VA, I was exhausted. 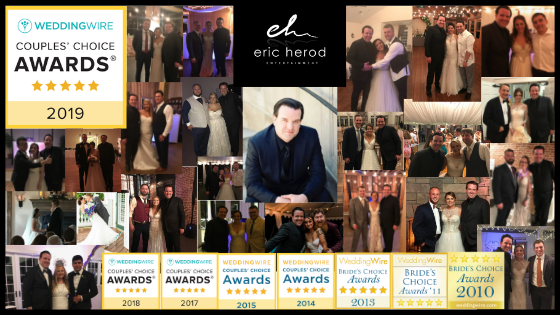 Today, Eric Herod Entertainment received a Wedding Wire Couples’ Choice Award for 2019. This is the 8th time receiving such an award and honestly, I haven’t paid one cent into Wedding Wire. Perhaps I should in order to compete with everyone else, but the satisfaction that comes from a couple’s review saying how much their guests will remember about their wedding, sharing how much they loved their love story, how their wedding exceeded their expectations, and even how much they enjoyed seeing me do the Wobble gives me solace in times that I struggle day to day. This may be one of the most honest, open, and candid posts that I have ever done, and in the last several months since April 28th, I didn’t want to post much. But to my past couples whom I consider family and friends, THANK YOU from the bottom of my heart. Some of you have pulled me through some tough days and you may not have even realized it, yet I appreciate every single one of you.